Webcam "Weather Webcam Andermatt "
In Andermatt, there is the Webcam Weather Andermatt with motif: Oberalppass/Rossbodenstock. The webcam Andermatt is regularly updated with new pictures. 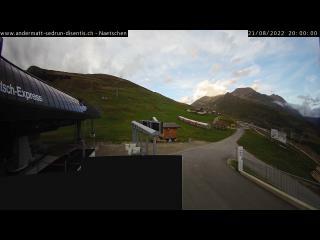 Track the current weather in Andermatt with the webcam ANDERMATT. Andermatt is a municipality of the Ursern valley of the Swiss canton of Uri and lies at the foot of the Oberalp Pass. Andermatt is the capital of the Ursern valley and extends up to the Oberalp Pass, which forms the border with the canton of Graubünden. Find out about the weather in Andermatt with our weather Webcam Andermatt. The current live Weather for Andermatt is provided by netatmo.